The morning seems like such a long time ago that I am having a hard time remembering exactly what all we did. It is coming back to me now-we had planned to wake up early to start on organizing my pantry. When I did wake up, I took everything out of the pantry and started putting a few things back in. I didn't have too long because I soon had to leave to pick up Reagan. She had spent the night with a friend. On the way home, we stopped by the library. Then headed straight home, and on the way home, Reagan chatted the entire time telling me all about the party. Once home. Robby and I finished up the pantry moving on to the fridge, freezer and snack cabinet. We had heard that it was receipt day at one Chick Fil A so we headed there. (Receipt day means that you bring your receipt back on a certain day next month, and you receive your meal for free.) We picked up lunch for everyone and brought it back home. On the way, we did stop to buy some Nyquil cough medicine. Campbell and Graham are still coughing at night-no fever or anything else that would make me want to take them to the doctor just yet. Now, Anderson did mention today that his ear hurts when he yawns. I told him to report back on that ear tomorrow-not that I really want to start on reaching my deductible tomorrow. We ate our lunches, and then everyone helped with the chores around the house. The girls cleaned out under their beds as the boys had done the other day. There was laundry and dishes-kind of nice having everyone help out a bit around here. Tomorrow we really should do some cleaning and not just straightening. This afternoon Keaton made her brownie dessert for tonight. Campbell made cake pops with her new cake pop maker for tonight. This took what seemed like forever, but she loved every minute of it, really I did too. Finally, Reagan worked on her brownies to take to her party tonight. This afternoon-well, really it was around 5 that we ran back to Chick Fil A to buy desserts for everyone. The Heltz were there and we brought Alyssa home with us. Soon Kennedy was here and the girls' jumped in the car with her to head to their first New Year's Eve party. I made soup for our supper while Robby made some desserts to help our celebration. The Heltz came over for a bit, and the kids enjoyed playing and eating. Whitman and Michael even played together some throwing snowballs at each other. They left before we ran in the New Year's since Candice had to work in the morning. That gave my crew time to pick up, take their medicine and put on their pjs before w played a game. We played Left, Right, Center with everyone. Graham was out of the game early but ended up still winning the pot of quarters. We finished just as it was time to ring in the New Year. We counted down with the tv and rang in the New Year with hats and blowers. As soon as the ball dropped, Robby had to leave to pick up the girls from their party. Once they were home, they headed straight upstairs to head to bed-possibly! I am about to go and check. Tomorrow we will work on our Dennie family resolutions and most excitingly (and laughable), we will recap the resolutions that we made for 2018. Whitman was not happy at all this morning when I made him put on his church clothes before I prepared his breakfast. I am not sure if he wanted to eat right away or if he didn't want to go to church. Either way, he started the day off in a not so good mood. The coughers, Graham and Campbell, were still coughing this morning. They did set by Nona and Pops during church so they could ride with Pops to pick up lunch. I had told them that if they continued coughing during church, then they were to leave. Graham made it through the whole service, but Campbell was quick to have a coughing fit and leave the service. Hmm, I wonder if that was all legit. On an odd note, Robby read last year's blog and saw that Nonna and Pops had BBQ the last Sunday of the year for lunch. And Campbell and Graham were sick then. They actually both had ear infections. Thankfully, they are just coughing now and haven't had any fever or ear stuff happening this year. This afternoon we spent it the way afternoon's should be spent-napping! Well, Robby and I napped. Campbell and Keaton played outside. Keaton also found some time to paint a book for her American Girl doll. Reagan spent most of the afternoon packing for her sleep over tonight. Around 6, Robby, Keaton and I took her to that sleepover. Then we ran back home to fetch everyone and head to the Wilson's house. They had pizza for us, and everyone enjoyed playing Catch Phrase. The kids were even able to (kind of) play the game. We might just have to play it tomorrow night! We had another day of cleaning and straightening around here. Now just between us, even though I adore having a straight house and even love throwing things away, I am getting a bit tired of all of this hard work. I think that I am ready for school to start-doing school each day is easier! This morning before I even brushed my teeth, I cleaned out the closet that my vacuum cleaner is in. Then Robby and I moved on to cleaning out underneath our bed. Since Robby had his allergy testing, we have been very aware of him coughing and sniffling each morning. So we began the morning by moving the bed and cleaning out under it. We are not filthy people at least I like to think so. But we just didn't have dust bunnies under our bed, we even had Easter bunnies under our bed-chocolate Easter bunnies. Gracious me. We moved every thing that I have shoved under the bed, and put it in a proper home. We also threw away my tacky bedskirt before remaking the bed. As Robby and I were slaving away on our bed, with mattresses, sheets, comforters and the headboard all moved around, Keaton came in and asked, "do you have bedbugs?" My child, dear me. We started taking a few Christmas things down before I loaded up to leave with Campbell, Keaton and Reagan. I had a few things to pick up at Walmart, but the girls could not wait until we got to Target. They all had gift cards at Target, and Campbell and Keaton spent all of theirs. Keaton had more Target money and bought clothes, a scooter, a holder for a doll on her bike and a Christmas shirt for Keaton. Campbell bought her a pair of comfy sweat pants similar to Grahams. Reagan didn't find anything that she needed. We also stopped at Starbucks as we were leaving. Campbell spent some of her gift card on a hot chocolate so I decided to buy one as well. It wasn't that great, but it did kill hunger. After our 3 plus hour shopping trip, I was starved! The boys and Robby had taken down the Christmas tree and put it away. They had also brought down all of the Christmas boxes for me to fill while Graham and Robby ran a few errands. They bought Graham a video game with some of his Christmas money and even made a grocery store run. By the time that they made it home, I had boxed up all of the Christmas stuff, made my crew shower (there was lots of trampoline jumping at the neighbor's house by the little 3 today) and fed my crew supper. Once home, Robby gave Campbell and Graham a good dose of cough syrup. Robby had bought a rotisserie chicken because I needed some meat for a soup for tomorrow's supper. We were standing at the bar working when Keaton, walked up and said, "is that a frog?" Well, our chicken was a bit small, but I don't think that it was small enough for someone to mistake it for a frog. Robby and I worked on putting the Christmas stuff back in the attic, Robby vacuumed some more and has emptied the vacuum canister at least 17 times today. Now, we still have a few more days on our clean out and I have 2 more closets to work on (plus school to plan) before the end of next week. The kids stayed up for a bit watching some football, before we finally sent everyone to bed. Hopefully, there will be even less coughers tonight! After I had already tucked in everyone, Robby called from upstairs asking if I had taken any pictures. I had forgotten about it, as I am doing more and more often. I ran up there with my camera and had to turn on the lights for the pictures. Anderson and Graham were whining and complaining about their eyes when Whitman shouted to them, "just be a man and open your eyes." Since Robby and I still had a full days worth of organizing to do today, we didn't sleep in as we did yesterday. Actually, when I walked through the house this morning, Anderson questioned, "what are you doing up so early?" We went right to work on sorting drawers and cords from the office. Robby is a cord addict-he probably has enough cords to circle the house a few times. It didn't take too long to get the office in decent order. But much of the morning was still spent on the little things-lots of little things that needed homes. I did stop in the middle of the organizing to make Dana's bread recipe. We had it at lunch, and it was pretty good. I don't think that it was my favorite but would definitely be worth trying again. We did eat most of it hot out of the oven though with some butter smeared all on top. After everyone had their breakfast, Keaton and Whitman sold popsicles. Since we can't really have a lemonade stand out here, the kids seem to sell snacks to us quite often. We did eat all of their inventory before Robby and I started back to work. Our final project of the day was the bonus room attic. Not surprisingly, we found more cords up there. This one didn't take too long for us to do once everything was reorganized. Now, we did stop there and haven't get gotten to the three other closets on my list. I do believe that tomorrow will be Christmas take down day. This evening we headed to ChickFilA to spend a few coupons that were expiring. While we were there, we received a text saying that the first 100 folks to buy a cake in an hour would get a free burger for the rest of the year. Well, since we were so close we decided to stop in for a few cakes. This time we did decided that we didn't need 6 cakes nor 6 burgers for the rest of the year. So we only bought 3 cakes-everyone stayed in the car except Anderson, Robby and I. We jumped in the line about 15 minutes before they started. As we were buying our cakes, the manager at the register recognized us and asked why we were only buying 3 and not 6. He remembered that we didn't miss any, and he also remembered that we would always order one Blizzard plain (Whitman's). We had a good laugh about that. Once at home, the kids had some downtime for a bit before bedtime. The coughing seems to be a little less tonight-Graham mostly. Now, Anderson did seem to feel better today so hopefully all of my people are on the mend. Robby and I planned to work on his office/pantry today, and we did that. Well, actually we are still doing that at 11 this evening. We started with the cabinets above Reagan's desk which took us until after 12. Then, we took a few things out of his office to put upstairs in the wrapping paper attic. I store some appliances/large kitchen items that I rarely use in that attic-like a punch bowl and a bin of cookie cutters. After taking those things up to the attic, we had to clean it up and organize that attic. Now, the attic was my Christmas storing. staging and wrapping area so it was pretty crazy. It didn't take long to clean, but we decided we needed a shelf in there. So the shelf came from another attic. Of course the shelf had things on it, so now those are strewn on the floor. That attic is now on tomorrow's to be organized list. Sometime in the middle of working on the attic upstairs, Robby had a shop to do at Blaze so Keaton tagged along with us. On the way home, we ran to Walmart and I bought a few more Christmas dishes along with some on sale Christmas candy. The afternoon was spent on cleaning up our morning messes from Reagan's desk area and the wrapping paper attic. The girls, Whitman and Graham watched a Redbox movie this afternoon. I even helped Campbell make a bracelet during all of this craziness happening in the house. Robby had to meet work friends this evening, so while he was gone I decided that since I have all of these new Christmas dishes, I really wanted them to be downstairs and easy to get to. For this to happen, I pulled out everything from under my bar and made room for those dishes. I had to bring Christmas dishes that I already have downstairs. Campbell and Keaton have a ton of kitchen stuff, so I also found bins for their cooking supplies that would fit in my cabinet. And while supper was heating up, I also decided that my 12 Days of Christmas glasses from the Dillon's should be used, so I rearranged the top of my cabinets to get them out of the attic. The kids and I then ate our supper while Robby was gone. Afterwards, they had their showers and helped me with straightening the house some. When we were gone earlier in the day, I had made a list of what I wanted them to do once I came home. I guess that Reagan saw it and thought that it was for them to do while I was gone. So she made everyone empty the trashcans; even made a chart to divide out who had what can to empty. So when I returned home, my list was full of initials by each chore so I could see who had accomplished what. Once Robby was home, I played Graham's new game with him, Campbell and Keaton. Then it was time to start on the main task of the day-his office/pantry. He worked on the cords while I worked on the food. The fridge had been outside defrosting for most of the day, and it will need to stay out there for a good while because the ice is thick on that thing. We are nearing the end of the closet project yet there are still so many things to go through and put up tomorrow. Our trash and recycle cans are stuffed to the brim plus I have folded boxes and full bags of trash sitting by every door in the house. My garage sale pile has also grown by at least 3 boxes since this morning. It is such a wonderful feeling! The kids were all pretty quiet today. Most everyone went outside for a little bit during the day. They all seem to have colds, well everyone but Whitman. Anderson and Campbell seem to be the most pitiful with runny noses and coughing. Graham and Keaton are also coughing, and Reagan seems to have a touch of it all. I did give Anderson some medicine tonight and now am regretting not giving it to Graham since I can hear him occasionally coughing. Hopefully, they all will sleep good tonight and feel better in the morning. It was a pretty low key day after Christmas around here which was perfectly wonderful. We all slept in for a while. Then Robby and I heated up leftover breakfast from yesterday. Everyone had their fill. While the kids vegged out on their ipads, Robby and I did a bit of cleaning and straightening around here. He tried out his brush for his drill. We did not surprisingly find out that our tile grout is filthy dirty, but the time it took for him to clean a few inches isn't worth the pay off. I organized a few different things-box of paint and candle and icing box. Now, I still haven't touched the laundry room upstairs that Robby wants me to clean out nor have we started on our grand plans of completely redoing Robby's office/pantry. Around noon, we headed to a few stores. Campbell had a lego set to take back at Walmart. We all found a few Christmas-y things to buy there even though we didn't really need anything at all. I did even get a few new Christmas dishes to go along with the ones that Robby bought me. Also, Keaton found Christmas stockings for her American Girl dolls for next year. I couldn't pass that good idea up. Reagan was desperately looking for an ugly Christmas sweater. She didn't find anything. We did look at Sams, Goodwill, and Target. She doesn't like the three that we have at home, nor could she find a suitable one this year. We had also looked last year, but hopefully she can borrow one next time that she needs one. We did an Academy run as well. The boys all spent their gift cards there-Graham bought shoes, Anderson and Whitman both bought a nerf gun and a tiny drone. Whitman was so excited to get a drone since he thought that Santa should have brought him one, however, he hasn't touched it since we came home. It was nearly 4 when we headed home, so we picked up pizza at ate it in the car. Once at home, we all had some downtime before the boys and I watched the Smallfoot movie upstairs in the bonus room. I also did a bit of my work-requesting library books and picking our Christmas pictures-while watching the movie. When we were still awake last night hauling stuff down from the attic, watching a Christmas movie and wrapping presents, we kept hearing someone move around upstairs. Knowing that it was too early for Santa on the roof, we had one likely suspect-Graham! Robby went up there at least once but the poor child could not sleep. I am not too sure if he was really trying through. Even though he was awake when we went to sleep, he was also awake when we woke up around 6:15. As soon as we rolled out of bed, Robby and I started on the first pan of monkey bread. We did stall until 7 since we had made such a big deal last night about staying in bed until 7. The boys were all sitting in their room with their blinds up chatting away. The girls were all laying in their dark room, however, their hair was all combed and their beds were made. Reagan opened clothes, an ipad, earbuds, gloves, a curling iron and scrunchies along with a stocking full of candy and goodies. Whitman received the one thing he had actually asked Santa for-a ChickFilA gift card. He also had a new ipad, a Spiderman scooter, a pillow, a Minecraft man, a workbook and a ukulele. Anderson opened an ipad, earbuds, a movie basket along with a certificate to bring some friends to the movie, drone and Star Wars waffle maker along with items to make waffles. Keaton had a new ipad under the tree with a bracelet maker, lip gloss kit, notebooks, a brush, pens and a movie certificate like Anderson's. Campbell also received the same movie kit, with an ipad, ear buds, a Lego set and doll pillow. Graham got the pants that he was longing for, money, earbuds, more basketball socks, a ladder, a beach towel and a game that we haven't gotten to play just yet. Robby received a google mini, a microwave cover and a brush for his drill. Yep, his present pile wasn't too exciting. I had a bag, shoes, dishes and stickers for my National Park book. I think that everyone was super excited about their presents. Christmas always stresses me out because of Christmas morning, but my people were pleased so I was also pleased. After everything was opened, Robby went to work on breakfast-sausage, eggs, another pan of monkey bread and biscuits-while I went to work on living room clean up. I bagged up the trash and broke down boxes. We both finished just as all the grandparents and Jason arrived. We had our breakfast after Grannymom gave Robby a lesson in how to make gravy. The kids also had some gifts that they had worked on through the year to give to the grandmas. Everyone looked at all of the gifts, and the kids played with everything that they could. I can tell that my crew is growing up. We are needed a lot less on putting things together and reading their instructions. They can pretty much figure stuff out themselves which is kind of nice. I can remember Christmases when Robby and I were both working like mad people trying to open this, put batteries in that, build this and read the directions to that. Things have definitely calmed down at our little house. After breakfast, we had time to straighten a bit. Robby worked on ipads as he pretty much did all day long. Then we headed to Dana's house for lunch. She had lunch for everyone including my folks and Jason. She had two pasta dishes, and they were both delicious. That along with all of the desserts, we certainly didn't leave hungry. The kids enjoyed playing outside and the un-Christmas like weather helped them since most of them were wearing shorts. After playing for a while, we headed home. The neighbors came out so the kids played outside for the rest of the afternoon while Robby worked some more on the ipads. For supper, we pulled out a Christmas feast of kitchen leftovers. It was pretty delicious if I do say so myself. Then the kids had theirs showers before we settled in to watch The Santa Clause movie. It was pretty entertaining, and we would have all enjoyed it more if Whitman would not have shouted, "I don't want to see this," for most of the movie. We also ended the evening with popcorn and some candy. After the movie, the kids had a few more minutes before bed. Graham, not surprisingly, was tired and headed to bed a few minutes before everyone else. He was exhausted from staying up so late last night and getting up so early. Christmas Ornament Countdown 2018: Merry Christmas! Merry Christmas! 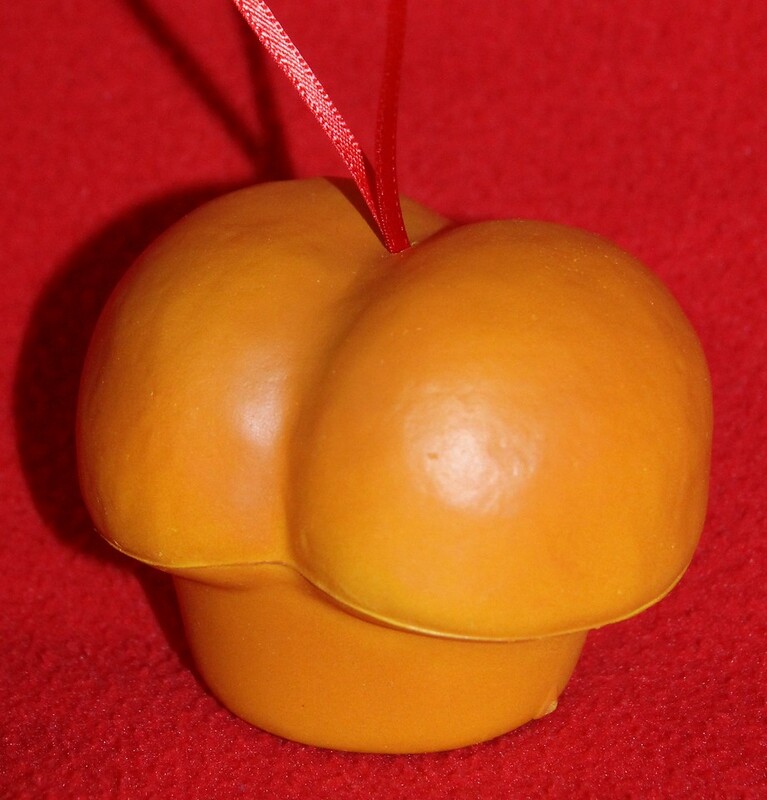 Today's highlighted Christmas ornament isn't too much to look at. 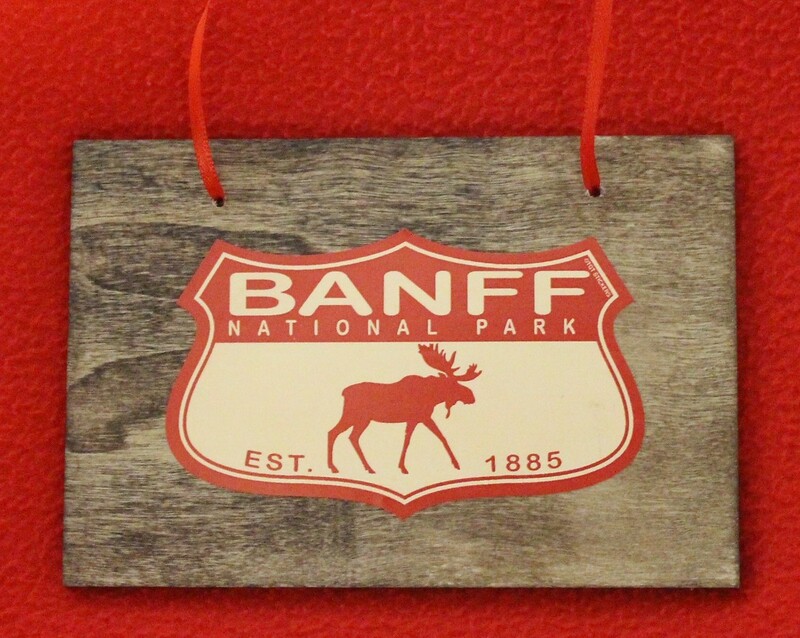 It is just a simple magnet from Glacier National Park. Glacier National Park had been on Robby's bucket list for a while so he was delighted to mark it off in June of this year. Unfortunately, our pictures do not do justice to all that we saw in Glacier. Despite not having bear spray, we took off on a 5 mile hike to Avalanche Lake. It was stunning and worth the muddy hike. The kids enjoyed walking in the ice cold water to take a few pictures. And, of course, a highlight on our return to the east slide of Glacier a few days later returning from Canada -- we spotted the elusive moose making all the kids a bit richer because Robby had put out a bounty on a moose sighting! Hopefully this next year, we will be able to mark a few more items off of our bucket lists, but I don't see how any will compare to Glacier National Park. Click here for the blog from our first day at Glacier. I still have more ornaments from previous years that have not made the Christmas ornament countdown lists. Hopefully, I will get to those next year, or maybe once again I will fill up the countdown with all new ornaments! The Dennie's hope that you have a very Merry Christmas. Briefly lats night, we wondered if it was going to be a long night. We were already sound asleep at midnight when Keaton stared coughing. Anytime she starts making noises in the middle of the night, I start calculating where the nearest trash can is and what obstacles are in the way between her and the bathroom. She didn't cough for long because she was soon grabbing for a water bottle. Of course, this caused Robby to jump up because he was concerned that she was going to spill the water on Whitman's head repeated what we had done at least twice on one of our last trips. She didn't, but it took her lots of squeezing of the water bottle before she was able to open it and take a sip. After that, we all slept soundly...well, most of us did. Anderson did say that he fell off of Grannymom's air mattress twice last during the night. One time he even admitted that his head was under the other bed while his feet were left on the mattress. I am not too sure what happened there, but gracious me it is a wonder that we get any sleep in a hotel room. We didn't make it to breakfast this morning until around 8ish. We were in no hurry since the main even for today was driving home. After eating the hotel breakfast-no bagels or flavored yogurt for me and no biscuits for Robby-we did stop for across the street for a donut for everyone. We love Hurts donuts, and the line did not deter us at all. It moved quickly, and we soon were picking out our favorite donuts. I had the simple struessel, and it was divine. We did have to wait until snack time to eat those donuts since we had just had breakfast. Now the kids asked me about a zillion times when we could eat those donuts. They were so happy when it was finally time to pass them out. The wait did help the ride go by faster and soon we were home. Well, we didn't go straight home-first we had to drop of Grannymom and Grandpa. Then we took the Wilson's some cookies and a Hurt's fritter. Afterwards, it was home for unpacking and unloading. The kids helped, and we even had a bit of time to relax. Unfortunately, our water bill will be sky high this month because during this unloading and unpacking Whitman was in the shower. He was also in the shower while I relaxed for a few minutes-yep, he was in the shower happily playing for well over an hour. Soon we were loaded and packed up again headed to church for the candle light service. Grannymom, Grandpa, Nonna, Jason and Pops were all there before us saving the entire row. We certainly needed it and were still all squeezed in. The service was nice. Anderson and Reagan opted not to go down when the kids all went to the front. I am glad that Graham still considered himself a kid and went down. They are growing up ever so quickly. We all love the candle light Silent Night part of the service at the end. Whitman wasn't too sure about holding the candle all by himself so he wanted my help the entire time. Once the service was over, we headed upstairs to take a picture or two before heading to Nonna's house for Christmas eve. Nonna and Pops already had the food warm when we arrived. Graham loves ham, and Nonna had plenty so he was one happy boy. Afterwards, there was more picture taking before we finally let the kids open their presents. I think that everyone was very pleased with their presents Whitman's favorite was a Minecraft t-shirt. Keaton seemed to really enjoy her hat, socks and blindfold. Campbell loved her blanket and is sleeping with it tonight. Graham's favorite was his jacket which he has been asking me about for weeks. Anderson loved his battlebot remote control things. Reagan, who is pretty picky, was super pleased with her stuff. I think that her favorite was a notebook, mechanical pencils and an egg fryer. After opening presents and playing with toys and eating lots of desserts, we headed home. We fed the reindeer-who doesn't love throwing oats, glitter and hay all over the yard and in your sisters' hair. Then we pulled our Santa countdown and talked about some of our Christmas ornaments. Robby read a bit of the Christmas story, before we set out cookies for Santa. The kids had a bit of time to organize their loot before we finally sent them to bed. I hope that folks are sleeping upstairs because I have quite a bit to do still before it is Christmas morning. 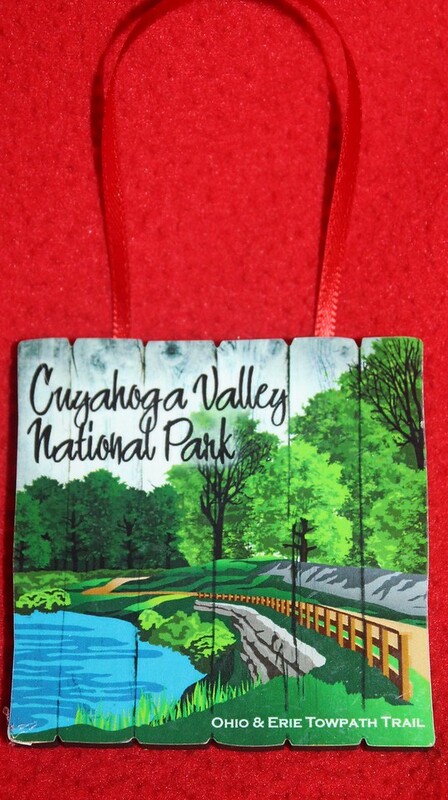 On our Dearborn and Niagara trip this year, we stopped at Cuyahoga National Park. We had already visited this park in 2011, but we could not really remember too much about it. It was a bit rainy on the day that we visited the park. Despite the rain, we still took a little hike down to Brandywine Falls. The hike was fun and probably even more fun in the rain. This park is one that we could certainly return to because we barely touched the surface of all to do there. I think I would enjoy taking a train through the park in the fall-I might have to add that to my list. Click here for the pictures from our visit to Cuyahoga. Even though we had a ton more things to do this morning before leaving for church, we still laid in bed until the last possible moment. I think that we work a bit better under pressure. Robby showered while I folded 3 loads of laundry and put the last few things in bags. Then he worked on the laundry while I showered, inspected the kids Sunday clothes choices and herded everyone back upstairs to brush their teeth. We only had worship this morning, so church seemed pretty short. They did sing Mary, Did you Know which is one of my favorite Christmas songs. Even though I feel like I haven't heard a sermon in 13 years, Whitman doesn't miss a word. He asked me what at least 3 words meant during the sermon. Most I can come up with an explanation, but sometimes I just have to tell him to ask me later and hope he forgets. As they were singing the last song, we scurried out of the church house so we could run to Grannymom's house to change our clothes. We did it quickly, and soon we were all loaded including Grannymom and Grandpa and heading to Branson. The ride up here didn't seem to bad. We had ham sandwich leftovers from Grannymom's Christmas. We only stopped once for a potty stop on the way here, so the crowd was getting a bit anxious when we arrived at Silver Dollar City. We were able to drop off Grannymom, Grandpa, Graham and Reagan. They had a short walk to the front and met us after we had parked the car. When we entered the parking lot, we started putting on coats and stuffing gloves and hats in my bag. The first thing we did was stop for all of the birthday people to get their treats-taffy, a mini ice cream cone and a popcorn. Campbell, Anderson and I were the birthday folks this trip. Graham and Whitman were the only ones who missed out on getting their birthday treats at Silver Dollar City, so I let him have my ice cream cone. We did ride Thunderation, Whitman's favorite ride. We also rode the swing and pirate ship rides. The crowds were crazier than any other time that we have ever been here. It was pretty wild to see. We made it over to Fire in the Hole and rode it twice before heading to see our show. We watched A Dicken's Christmas Carol. It was pretty magical and even snowed at the end of it. Whitman probably wouldn't call it magical since the ghosts scared the mess out of him. He was shaking at one point. Now, don't tell anyone, but since he was pressed up against me in my lap and Keaton was snuggled up to my arm, I might possibly have missed the second Christmas ghosts. Robby said that she was the funnies and he doesn't see how I missed it, but yep, don't remember a bit of it! It has been years since we have been here at Christmas time. I tell you, it was just magical. The lights were absolutely beautiful. When we walked out from the play, it was dark and the lights were shining. The weather was cold, but not miserably cold. It helped that after we walked through the lights, we then headed out of the park to our car. We had planned on eating at Steak and Shake, but the line was long so we just grabbed our food to eat at the room. It was a bit of a haul to get to the hotel, but our food was still warm. We passed out the food and everyone gobbled it down. We were all starving since it was after 9. Graham and Campbell ended up in Grannymom's room. The rest of the crew is in our room. Whitman is between the beds and is actually kicking our bed right now. Anderson is trying out Grannymom's new inflatable mattress so he thinks that he is in heaven. It was a perfectly wonderful day! And a great start to our 24 hours in Branson. So even though I have 25 new ornaments this year, don't think that I have spent money on each and everyone of them. This one is a prime example...a water cup from Wall Drug in South Dakota. 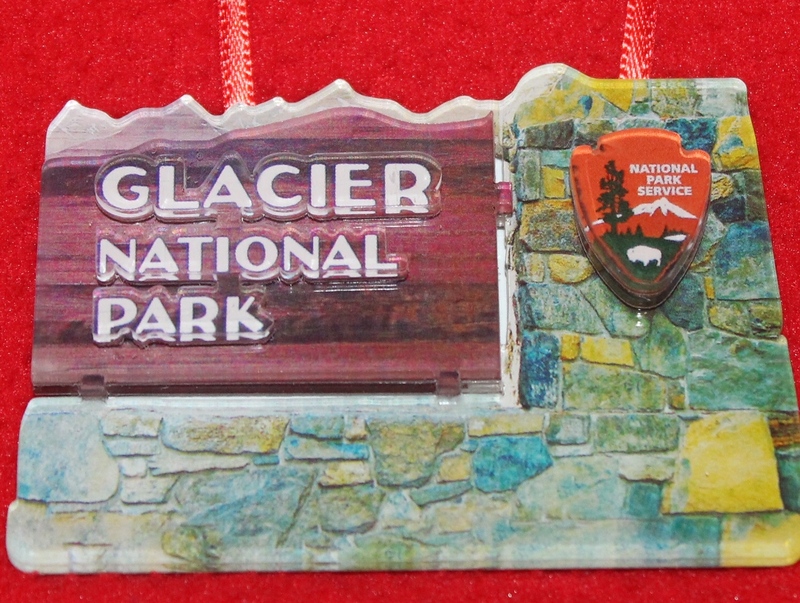 We have been to the tourist stop many times before but have never left with an ornament. This year, I did walk around some looking for an ornament to buy when the boys suggested that I use one of the free cups from the store. 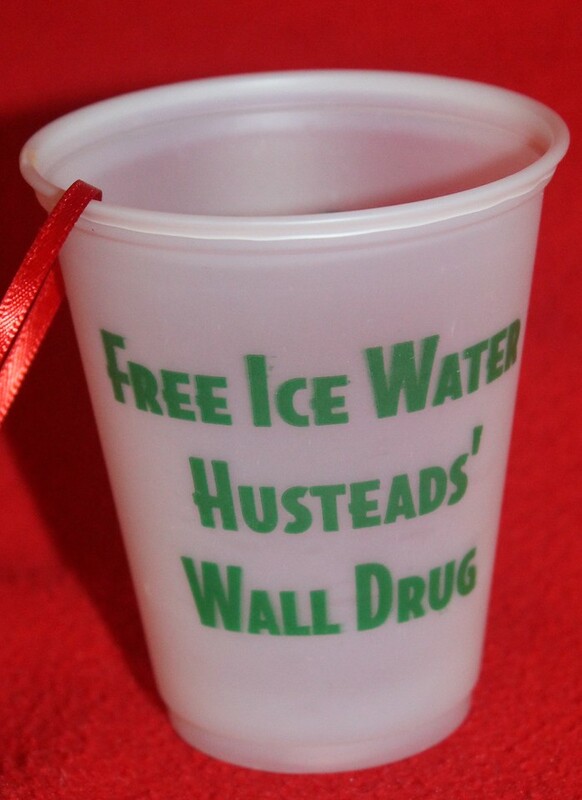 Wall Drug has made their business in giving out free cups of ice water so of course my ornament from there should be a "free cup." Here is the blog from that day. There wasn't too much happening here early this morning. Whitman was going through his new loot pretty quickly. I had to open play doh can after play doh can. Then there were the magnets that I had to pry from the box. By the time all of his presents had been played with, I decided to climb out of the bed. It wasn't too much longer that Robby, Anderson and Graham left to help the Heltz out in sawing up and moving a two trees. We were actually at the Heltz house when the trees were cut down, so the boys did get to see it to completion. They worked for about 3 hours and finished the trees. Both boys were able to drive the tractor and trailer so they enjoyed working. Meanwhile, back at home the cookie workshop was in full swing again. We had about 3 dozen cookies that we had not iced. We made one batch of icing and that along with a few leftover colors from yesterday we were able to finish. Campbell stuck with it the longest today. Whitman did a few, but just about as soon as he was finished Keaton stopped too. Reagan, who was awake yet still in her bed, opted to pass on this round of cookie decorating. There was laundry and some packing before Keaton and I loaded up for the Dollar Store. She had bought presents for everyone in the family and had forgotten Robby. I had tried to offer to pick up what she needed on other trips to the store. However, she refused and wanted to go herself. Now, she did also buy herself a pair of sunglasses along with some pixie sticks that she promptly split between her brothers and sisters when she came home. While Keaton and I were out, we stopped for gas and checked to see that Robby and the boys were celebrating their hard work at Freddies. We met up with them and did some shopping at Walmart-light bulbs, dishwashing detergent and trash bags-we are full of excitement. Back at home, the kids played outside with the neighbors for the entire afternoon. We had plans of making rice krispy treats but opted to skip out on that. Instead we had some downtime, until it was time for us to leave. Tonight we finished off our Christmas lights with a stop at the Inflatable House in North Little Rock. Then we drove to the capitol and walked all around in. I am always impressed at how beautiful our capitol building is. Then we had supper at a pizza joint downtown. Three of six Dennie kids had salad as part of their supper. If you could guess would you have chosen the three salad eaters as Reagan, Graham and Campbell. While Graham was eating his salad, Anderson looked at Whitman and said, "you are my only true brother." I guess he deemed Graham as a traitor since he was eating salad. After our pizza, we headed to the Capitol Hotel. I don't think that I had ever been there. The tree there was gorgeous and the kids enjoyed exploring the huge gingerbread house. We also went out on the balcony which was really neat. Once we made it home, it was shower time, but also time for all of the kids to pack. There seem to be lots of bags and lots of clothes and lots for me to pull out of the clean laundry which I still have to pack. So little time and so many Hallmark movies left! I am sure that I have said it before, and I will say it again, but Greenfield Village and the Henry Ford Museum is my favorite place ever. It is like a history Disney World-it is truly magical! Altogether we probably have around 5 ornaments from there, but I love every single one of them. 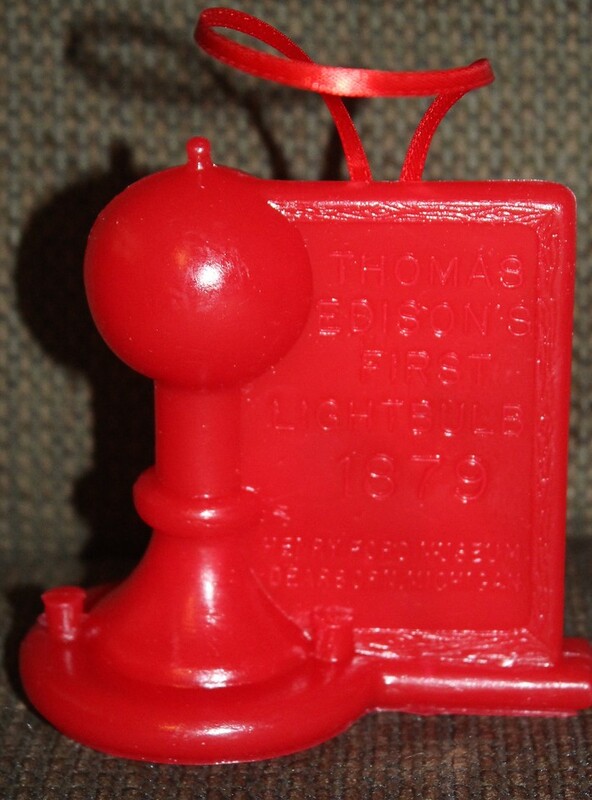 This ornament is of Edison's first light bulb. At Greenfield Village you can walk through Edison's Menlo Park laboratory along with some other buildings related to Edison. It is all so amazing being right there where Edison did some of his work. I hope that we will be able to visit Greenfield Village again this next year. I am not sure if I should get another ornament from there though-my tree isn't that big. Here is the blog from this year's Greenfield Village visit. The first order of business this morning was decorating at least 4 dozen cookies. Campbell, Graham and Keaton helped me make 9 different colors of icing. Then everyone was summoned to start their decorating. I did make sure that everyone knew that they would need to ice at least 4 cookies. I do think that everyone did many more than those. Graham made a cookie that was Reagan's favorite. Anderson worked hard on an intricate gingerbread cookie. Reagan did a melting snowman which was really cute. Campbell and Keaton also did really well. Whitman took his time and knew exactly how he wanted his cookies to look. Now, we won't be on any cookie decorating challenge shows, but all of our cookies looked really good, and when they were put on a plate they were pretty eye catching. Everyone that knows me will be shocked to learn that when it was time to leave the house this morning, I left my kitchen a wreck. All of our cookie decorating was still happening. There were bags of icing, cookies, plates, bowls and toothpicks on the counter, icing smeared everywhere and even things everywhere on the floor. And yep, I left it just like it was! Maybe I am going through the change or something-I haven't even used my weekly/daily list in a few weeks! I guess my mind was on the kitchen so I forget to pack candles for Campbell's birthday. We did improvise with coffee stirrers so when we were at Krispy Kreme, Campbell was able to blow something out. Now, Campbell was a tad bit embarrassed by us singing to her with her coffee stirrers in her doughnut! Actually, I think that mortified would be the actual word. Of course, this didn't stop Robby and I from singing-we probably got a bit louder when she put her hands over her ears. We all had a doughnut or two, and then we headed to the library to hear Craig O'Neill read The Grinch Who Stole Christmas. Craig was dressed up, even painted, to look like the Grinch. Whitman enjoyed every bit of it, but he did make sure that my hand was on him at the entire time. After the story, we had some ice cream. Then some of the kids were able to dip pretzels in chocolate while Keaton and Whitman decorate ice cream cones as Christmas trees. There were crafts to make to but we bypassed those so we could take a picture with The Grinch. We did have to run a few errands on the way home looking for one final Christmas present. After finding it, we were near a Chick Fil A so we stopped in for lunch. Campbell thought this was wonderful-doughnuts and Chick Fil A all in one day. Once at home, the kids started work on the house, while Robby and I worked on the kitchen. It took us both to get the place cleaned up and unsticky. When Reagan finished her work, she sat down and iced as many cookies as she could until our icing ran out. Now, we still have some cookies that need to be iced but that is for another day. Campbell and Keaton played with the neighbor for a little bit. Then it was time for us to scurry around and get things ready to leave for the Dennie family circle Christmas at Grannymom's house. Everyone was already there when we arrived. Grannymom had a game for us to play first. Then we all opened presents. As always, we go in age order. Whitman was first-I believe that his favorite present was the snowballs from Dana with his tent a close second. He is actually sleeping in it right now. Keaton told me that her favorite present was the Jolly Ranchers. Campbell must have enjoyed her jacket that best because she wore it most of the evening long. Graham liked his ball thing which was put together and played with until bedtime tonight. Anderson always loves Legos and worked his also before bed. And my Reagan, she told me that last year she would just lay out her Christmas gifts upstairs and look at them. This year, she has already started her pile of gifts in just the same place ready to stare at her loot this year. After opening presents, we all had supper and sat around and talked. Once everyone headed out, we also loaded up to come home. The kids helped unload and then laid out their goodies all over the house. I also laid my presents out just like I have been for years! Robby and I ended the evening watching a Hallmark movie and eating a cheese ball! A pretty wonderful evening. Instead of heading back home in June after hitting all 50 states, we turned and headed towards Canada. When Robby saw that we were so near Banff, he couldn't wait to get there. Indeed, it was stunning. We have been many places but I dare say that Banff is the most beautiful place that we have ever been. The blue of the waters from the glaciers was stunning. It was definitely a place that we could have explored longer, but the 24 hours that we were there so enough for us to always remember it. Here is the post from that day. This could have been our first day to sleep in but since workers were coming to the house, we were moving at the same time as usual. Tomorrow won't be a sleeping in day either since Campbell needs her birthday breakfast. The first order of business this morning was laundry, dishes and by the time that we started work on our sugar cookies, Grounded Electric was there to put in can lights in the living room. We had talked about 6 lights and then wondered if we should get 8, but finally we ended up with 4. The four lights look just great and we really think that it is bright enough in the living room. It does make a huge difference. Robby is already working on what house project he wants to do next. Keaton, Campbell and I made 3 batches of sugar cookie dough this morning. Three batches of sugar cookie dough is a lot of cookie dough-we used 10 cups of flour! Once we were finished with that project. Keaton and Campbell loaded up with me to run a few Christmas errands. Once we came home, the lights were almost finished so I did a bit of wrapping. Then Robby and I ran an errand to pick up one tiny Christmas gift and ended up with a few pieces of baklava for our ride home. The kids were outside playing with the neighbors and stayed outside until it was time for us to leave for the Craft Gingerbread House party. Whitman does not get excited about much, but the gingerbread decorating today thrilled him. He could not wait to get over there and was so excited about these houses being big. Whitman did spent quite a long time on his house, but Anderson worked the longest. At one point, he said, "I bet all of my buddies are outside having fun." I told him that he could quit and go play, but he refused and continued working on his house. His gingerbread house is indeed the best at this house. Though, there are no prizes. Once everyone had finished their houses, we wrapped the houses up and let the kids play for a bit. It was pretty chilly outside-chilly enough that Campbell came in asking to leave! Back at home. we cleaned, showered, ate supper and cut out and baked about a zillion sugar cookies. For some reason, for the last week we seem to be doing two loads of dishes a day and at least 2 loads of laundry each day. Christmas and all of its festivities are not for the faint of heart. After the cookies were finished, we made some popcorn and settled in to watch a movie! Of course, by the time that the movie was over, it was 11! At some point during the movie, while I was resting my eyes, I heard Reagan comment that I was asleep. Robby replied that I work hard during the day. Reagan then jokingly questioned, "what does she do all day?" This was all I needed to wake up very quickly and begin reciting a few of the things that I do all day! Since we ended up with a bonus day on our September trip, we had time to do a national park site tour through Ohio on our way to Niagara. Perry's Victory Peace Monument was the most difficult park site to get to-a ferry over Lake Eerie. The 20 minute ferry was rocky yet fun. 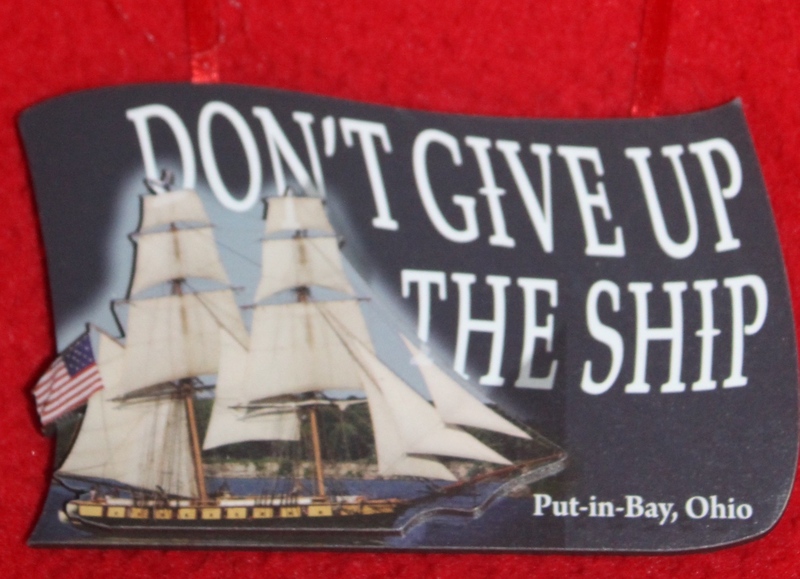 The town of Put-in-Bay, where the monument is located, would be quite an active summer town. Yet, when we were there it wasn't too busy. The monument was neat, and we were glad to mark it off of our list. The kids received another Jr. Ranger badge upping our count of badges as well on that day. Here is the blog from that day. Today was our last day of school this week, well actually for the year. I think that everyone was excited about the break. They all buckled down and got to work. Everyone finished at a very decent time this morning. Though when I did look back at the work that had been done, I did notice that Keaton had skipped quite a few things on her list. She did all of her paper work (phonics, math, etc.) but there were other things that just weren't done. Nothing was difficult things, but they were all things I would have seen her do like read to a stuffed animal for 10 minutes and look up a word in the dictionary. I didn't say anything though since I am already on Christmas break, but I did make a note to remind myself to watch that sneaky little girl like a hawk when we start back. I wrapped a few presents before lunch-I think that I could become a speed wrapper. Now, my wrapping wouldn't win any awards at all, but I am getting it done. I only have 15 more presents to wrap, not too bad since I wrapped 7 presents in around 20 minutes. Yes, I know 15 presents to wrap seems like a lot, but the three that I have yet to buy are what is hanging over my head! But no worries since I am going to knock that out tomorrow. While the kids were playing outside, I left to go and see a friend and her son at the hospital. They were in the middle of a procedure so I only got to see my friend for about 20 seconds. I did pass her an envelope full of cards and a little Lego thing. She wrote me later and said that they had already worked the Legos and her son said it calmed him down after his procedure. So even though I didn't get to see them, I was still there at just the right time. Tonight we celebrated Campbell's birthday. She had celebrated with her friends this summer for her half birthday. Tonight was the day that she was able to celebrate with grandparents, Uncle Jason and Cash. Yesterday, I had asked her what she wanted for her dessert, and she picked some thing from the pantry. I told her that she would have to make two things so we would have enough. That was fine with her, and after her school work today she made both desserts by herself. Well, she did let Keaton help a tiny bit. We had chili for supper, and then let Campbell finally get to the presents. The girl racked up! She opened gift cards, legos, a sequin pillow, devil sticks, a gallon of glue (for slime) and plenty more things. Then we blew out her candles on her delicious desserts. Next the kids ended up outside...even though it was raining. Of course this meant that once everyone left, they had their second shower of the day. Yes, that means that we have washed two loads of laundry tonight and could probably scrounge around to get one more! By this point in our Alaska trip, I was almost finished with buying ornaments. 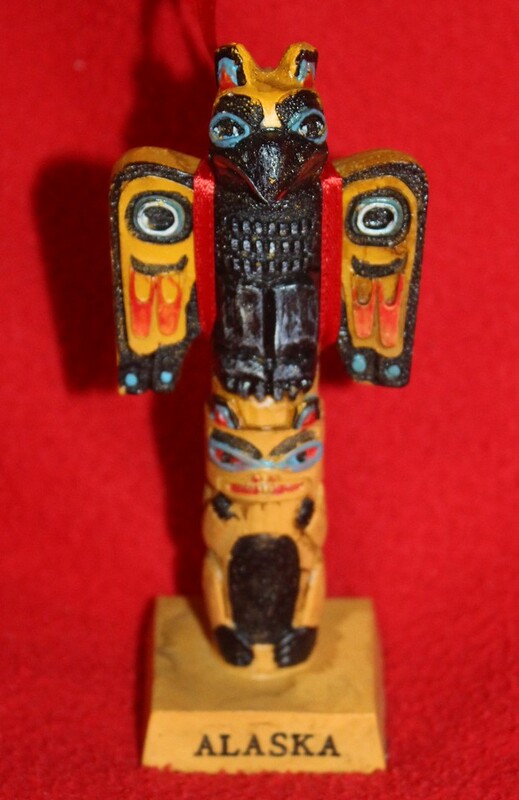 However, Whitman took a real liking to the totem poles in Ketchikan. He wanted to make sure that we all knew that the totem poles told a story, and he wanted us to guess what the story of each totem pole was. Our walk through Ketchikan was wet, and therefore a bit short, but we really enjoyed it. Here is the blog from that day's adventures. School day number two this week. The kids ate their breakfasts as we did our morning reading just as usual. We are reading a few Christmas-y Bible verses each day. So I handed Campbell the Bible and thought that she would look up the verses that had her name written beside them. However, she somehow read the exact same verses that Keaton had read yesterday. Of course, I was the only one who realized this...which makes me wonder, am I the only one listening and learning anything during all of our reading? I am not exactly sure why, but the kids have been finishing their school work early. This is a good thing possibly. But since they pick out what they have to do each day, by tomorrow it will all have to be finished...even the hard stuff that they have saved for the very last day! Eeek! Not so sure if anyone will actually be finished early tomorrow. We had our lunch after school. Then everyone stared on a few chores. I worked on trying to clean the boys' windows. They have gotten a bit moldy or something-y since they get wet each cold morning. I sure do't want any of that messing with Anderson and his allergies. Speaking of allergies, even though Keaton doesn't really have any-her excema is sure flared up right now. During our reading this afternoon, I read some and then everyone picked out a Christmas book and read it out loud to the group. That was quiet entertaining and took a while! The kids played on their devices for a while. The neighbors did come out for a little while this afternoon so they all ran out to play. They played basketball and four square for a good while-long enough to come in and be all stinky! We loaded up to start Campbell's birthday celebration with dinner at the restaurant of her choice-Taco Bell. Then we also went to see Wreck it Ralph. Now, Whitman did not want to see this movie at all. He had seen a commercial and was scared to death of the princesses in the movie. I am not so sure how our Disney trip will go over with poor Whitman. 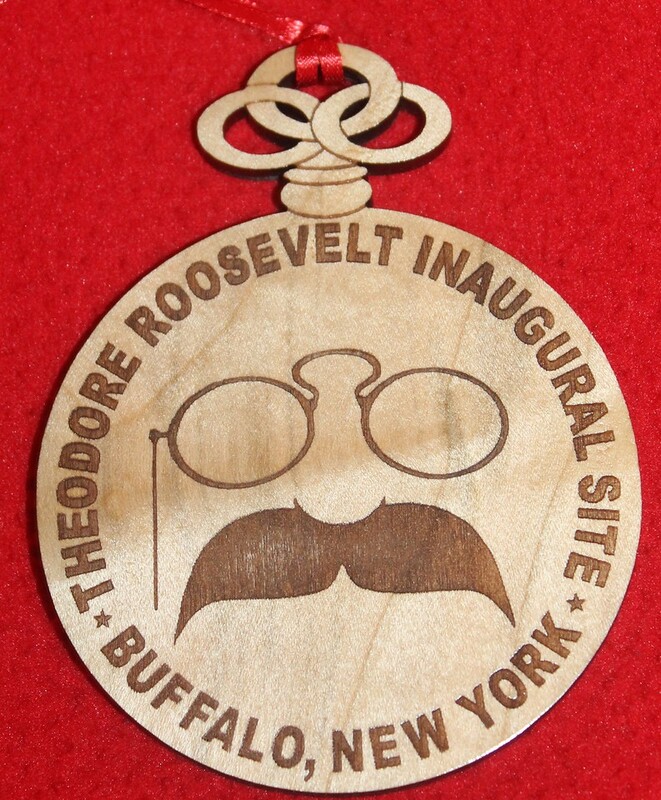 We have been to Roosevelt's Inaugural Site in Buffalo a few times. I don't remember that we have ever taken the tour of the house. This year on our spur of the moment road trip to the midwest and beyond, we packed in a lot of history and Roosevelt and his inaugural site was part of it. The tour around the house was decently high tech with lots of voices speaking about the events in history. The preview room was full of sites and sounds from the World's Fair that was happening during that time. It was all pretty impressive...but again, if you have seen one old house then you have seen them all. Here are is the post from that day. Monday morning and the kids were up and ready to start school. They could not wait to get downstairs and pull out their school work. Not really. Campbell, Whitman and Anderson were awake this morning and on their ipads. Not really sure where Whitman slept, but his water bottle was in Anderson's bed so I guess that Whitman crashed with his biggest brother for at least some of the night. School was fairly uneventful today-well, until Robby came in and told us that Santa was at Bass Pro. We cleaned up a little bit, put on clothes and took a break from school. There were only about 10 people in line for Santa and the Kamps were one of those. The kids were super excited to see their friends for a few minutes. We then walked through the store for a minute before picking up fries from Chick Fil A. We did run into almost everyone we knew who goes to Robinson Middle school. They were all on a field trip. We scarfed down the fries on the way home. Then we had the rest of our lunch-today has been clean out the fridge day. We made a bit of a dent before having everyone start on their chores and the rest of their school work. When Anderson and Whitman finished their work, we did a bit more reading. Then the kids had some free time. I did have Campbell and Anderson wrap their presents to their sibling. I actually spent most of the afternoon in the attic wrapping presents. Soon I did leave for Bunko. I left ab it early so I would have time to do some shopping. I was only able to go to Kroger, but found plenty of things there to fill my shopping cart. Then I met the Bunko girls at Tacos for Life. Meanwhile, my crew was eating their supper. Robby said that he felt like a short order cook helping everyone make and find their supper. After supper, the kids had their showers and then settled in for a movie-they all watched a Hallmark movie without me! Graham and Reagan were the only ones awake when I made it home. Just two more days of school left before our Christmas break! 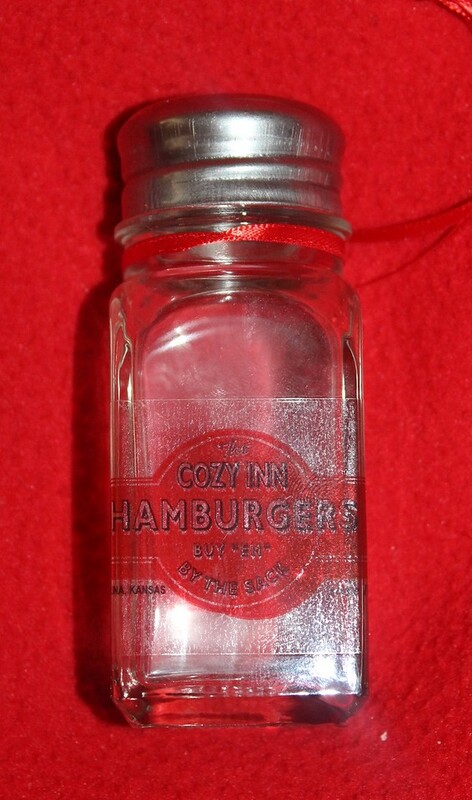 On the second day of our all 50 states road trip, we stopped at the Cozy Inn in Salina, Kansas. It was a burger joint that served up little sliders. Their max seating capacity was less than our family, so we opted to eat outside after Robby ordered our food. However, after just being in the restaurant for mere seconds, we left reeking of onions! Not all of the kids liked the onion-y burgers but I sure thought that they were delicious. It was a pretty good Mother's Day lunch stop. Click here for the blog from that day. Anderson was already dressed this morning when I walked through the house. I was on my way to go upstairs and start waking everyone up. It was good to see that he did already have his clothes on, yet it looked a bit like he had slept in his clothes. Possibly, I need to pull that iron back out-nah! We were soon headed out to church. The music was the same as last weeks-the Christmas choir special. The sermon was different but the music was the same to give folks the opportunity to bring guests. Anyway, despite the beautiful music last week, when Anderson realized that the music was going to be the same, he exclaimed, "well, why did we come back?" I was in the nursery so I did miss the repeat performance. However, I did manage to finish up just in time for the last song. After church, the kids, Robby and I headed to our Sunday school class. Today was Christmas parties in our Sunday school classes, so we were pretty busy by the time the morning was over. We had lunch at Nonna's house. They had spaghetti and the fixings for lunch. Then we celebrated Campbell's upcoming birthday with a birthday cake. After the kids played for a bit, we soon headed out. Robby started to work on preparing food for tonight's shin dig while I took Reagan out shopping. She said maybe 4 words on the way to the stores, but after shopping at Old Navy, Target and Platos Closet, she chatted the entire way home. We made it home in time for me to lay down for about 5 minutes before it was time to start getting ready and loading up food for our Christmas party with the Wilsons, Atwoods and Phillips. We had tons of food and lots of laughs during our party. I did make sure that I took my vest off for our group picture since I didn't want to have to retake it! I ate pretty much the entire time and especially loved Laryn's sweet oyster crackers. The kids had not been to Lamberts in Missouri. This March, we were in Branson with the Wilsons, and we all drove to Lamberts for supper. I don't even remember being hungry when we went, but we sure ate our fair share of food. The kids absolutely loved Lamberts! It started with the huge drinks that they brought for them. It was like they were drinking from Sonic Route 44 drinks. This of course made them happy. Then the man came out and starting throwing rolls to people. You should have seen Whitman's eyes light up. He was quick to get in on the action of catching the rolls. Campbell just spent her time catching rolls to fill up her to go box! Every time that we have been back to Branson, the kids have begged to return. Maybe sometime next year. Here is the post from that trip. Basketball day! Keaton took a little bit to wake up this morning, but she was soon running through the house in search of her basketball uniform. The others were soon moving around grabbing their breakfasts. Keaton's game is always fun. It takes about 5 shots for either side to make a basketball. And since we are sitting with all of our grands, the Heltz and their grands, and the Kamps our section gets a bit noisy. There is lots of clapping, shouting "the other way," and laughing so her game is quite possibly my favorite. Now, Keaton might just be a little basketball player. She is a super good guarder, and even scored a few points today. After the game she went home with Lily and Eden and Noah came over here. The boys played the xbox while the girls helped Robby make some cookies and played outside. I was looking for a few more presents (struck out) and picking up some groceries. After we cleaned out the fridge for lunch, we headed back to basketball. Campbell's game was next, and she scored today. Now, my girls are not timid at all. They just do super great! Campbell scored this week, and their team also won. Graham's game was next and boo if they were again so close but still didn't win. Graham tries his hardest. His team is pretty decent really. The keep the score close but just never can finish with a win. I do hate this, even though I feel that losing is really good for the kids. However, Graham is the Dennie who takes it the hardest. He just gets so bummed about them losing. And Anderson's game was the last game. He has one great coach and one coach who one family member (you know who you are) offered to go and punch in the face. Most of Anderson's team plays super hard. Anderson included; I really think that the Friday night practices have been really good for both boys. The team Anderson played today was a bigger team then his team, but again they squeaked out a win. After the game, we took Alyssa Kate home, and soon the kids were playing outside with the neighbors. Robby used the leftovers in the fridge to make nachos. Then we decided to go and look at Christmas lights. Robby offered for the neighbor girls to come with us. Let me mention that he is such a fun dad. I need a bit of time to prepare for having extra people. Robby, however, is always offering for kids to come with us-one extra last night, two extra during the game, two extra when looking at lights. It is always a party around here. We went to Richardson Place tonight to see their lights. They really go all out so there were lots to look out. We ended the evening with Chick Fil A shakes and ice cream. I have been waiting all season for their peppermint milkshake! Once we made it home, it was shower time for the kids, but we also had time to brown 3 pounds of meat, make a few dozen cookies, fold a load of clothes, start another load of laundry, empty the dishwasher and watch a Christmas movie before bedtime. I did want to wrap a few dozen presents but that will have to another evening! There are just some beautiful places in these 50 states. I think that we had even seen some of this area before, but this time we drove through the Columbia River Gorge on our way to Portland, Oregon. It was just mile after mile of beautiful scenery. We walked up to Multnomah Falls though we weren't able to get too close due to a forest fire a few years ago. They said it would be years before you could go back up to the bridge near the beautiful waterfall. 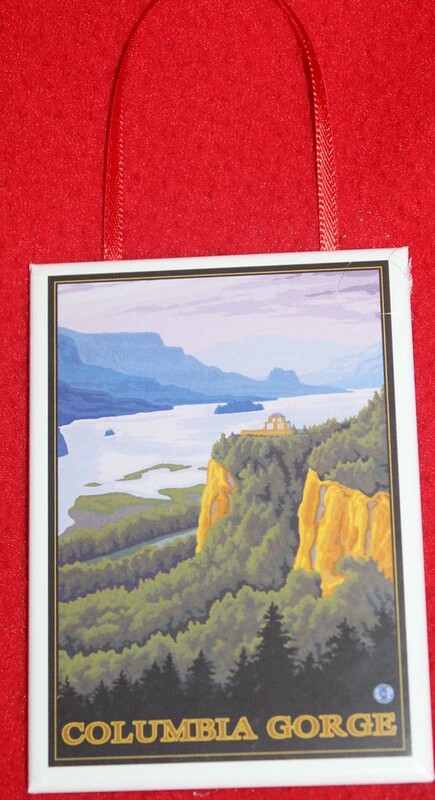 Then we drove to the Vista House and overlooked the gorge. Here is the post from that day's travels. No one was super pleased about having to do school this morning. It is hard to take a break in the middle of the week and then get right back after it the next day. It did cheer them up to learn that we only have three more school days until the end of the year. I still might try to to read that history book on a few of our days off. I have not yet checked to see if we are half way yet. But my library pile is down to only 71 books checked out so that is at least a good thing. For some odd reason, Anderson was finished with school around 10:30. I tried to find something that he missed, but it looked like he did indeed do it all. Some days there writing assignments are just shorter and when you add that to an easy math lesson, then you are set! Everyone actually finished at a decent time. Even ole Whitman, bless. I feel pretty confident that if Whitman was in a classroom, he would be super far behind or would definitely be on meds. Though sometimes, and it happened today, things seem to click for him, and he can speed through his work. We tried to clean out the fridge for lunch, but there is just too much in there for us to even make a dent. I read a bit during lunch and then even read some more after everyone's chores were finished. Anderson was the one who had to have his shots today. He is used to having his flu shot so he didn't mind, but after thinking about it for an hour I think that he got a bit nervous. He was fine afterwards and even laughed at himself for getting worked up. On the way home, we grabbed Sonic drinks as a rewards. Then we dropped Whitman off at Nonna's house for the evening. My Whitman had spent most of the day making a fort at home so I would bet that is what he did at Nonna's house tonight. Alyssa came over to the house tonight to spend the night and the Wilson's came over for supper. We had tacos and all of the fixings. The kids watched a movie and then played outside for a pretty long time. We did let them stay up until almost midnight so we will have some pretty tired basketball players tomorrow! We always try to hit as many National Parks as we can. In Washington state, we had a few hours and decided to go to Olympic National Park. It didn't take too long before we realized that we had found a hidden jewel. Olympic was stunning. We walked through thick trees to a waterfall. Then we found a gorgeous lake. They had little cabins around that we immediately decided that we wanted to come back and stay a few days. We enjoyed it so much that Robby even bought us t-shirts from there! Here is the post from that day. Even though there wasn't school this morning, we did still work together. First though, it was time to celebrate Anderson's 12th birthday. Since we did sleep in, we didn't make a special breakfast instead Anderson's poured himself a bowl of cereal. He is also the one who asked for a candle! After lighting the candle, we all sang to him before we did our work together time. The kids were thrilled about not having school. Once we did finish our reading, everyone worked on their chores for a few minutes before some free time. Right before noon, I took everyone to Grannymom's house so I could do a little bit of shopping. The kids had lunch over there, and Grannymom had cupcakes to celebrate Anderson's birthday a bit more. While I was shopping, I stopped at around 9 different stores. I finished just as Robby called from picking up the kids. Earlier in the day, Robby had asked Anderson what he would like to eat tonight. after much thought Anderson did say that he would like to have chicken and waffles. We all met up at Chili's since that is the only place we know of that has chicken and waffles. There waffles are so sweet, and we bought way too much food! Whitman didn't have any shoes but since Robby carried him through the downpour, he was fine. From there, we all ran home for about 10 minutes before Robby turned around to take the boys to basketball. Campbell also went along for the ride. While they were gone, I did a bit of looking at all of my purchases along with some work for school and quite possibly a Christmas movie. Robby did some speed grocery shopping while the boys were at basketball practice. When they came home, Nonna and Pops were here with cake and ice cream for Anderson's birthday. We didn't do a whole bunch today, but we did do a lot of celebrating. 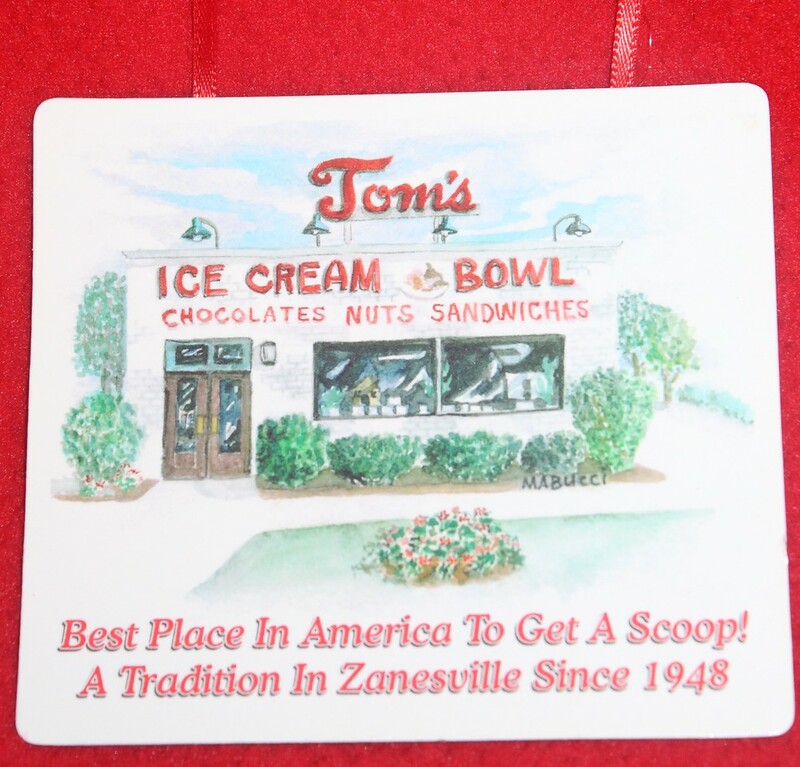 In Zanesville, Ohio is a little place called Tom's Ice Cream Bowl. During our September trip, we had looked for ice cream for a long while. We even tried to go to two ice cream places that were closed-imagine our disappointment. We were a bit concerned about this Tom's Ice Cream Bowl because it was in the middle of a residential area. We were delighted when we finally found Tom's. We assumed that the scoops would be like others, so we ordered everyone 2 scoops. The scoops were ridiculously huge-so large that I couldn't even finish mine! Here is my write up from that day. What a day this has been-it has been pretty wonderful whirlwind of a day. We were awake even a bit early this morning and before we are normally awake, I was putting away dishes and folding laundry. Soon our buddies started arriving, and the kids could hardly contain their excitement. Well, Whitman was pretty ready for everyone to go the minute that the arrived. We had lots of activities planned, but first we started with breakfast. Heather had brought muffins and juice for all of the grownups. Then we started on all of the crafts. The kids made bath bombs, cookies in a jar, dipped chocolate spoons, candles, and sets of magnets. I was super dreading all of this, but it worked so much better than I could have ever imagined. The kitchen was of course a wreck after all of those craft projects, but we were able to sweep most things up before we started passing out lunch. The moms had brought potato soup and all of the sides for lunch. The kids ate outside and then played until we cleaned up the lunch mess. That was kind of the theme of the day-making a mess and then cleaning it up. Anderson didn't eat any lunch because he said that he didn't like potato soup. I tried to explain that potato soup was like mashed potatoes but that didn't seem to help. Now, much later in the afternoon he was the child who was starving to which I said too bad! The next activities were a snow man relay outside and then a massive game of bingo. After that, it was time for the kids to pass out the presents that they bought. Anderson opened a basketball, Campbell and Reagan had red box gift cards, Whitman had a blow gun toy and Graham and Keaton opened up candy. Everyone was pleased with their loot. Then we went in the kitchen to sing Happy Birthday to all of the December birthdays-Anderson, Lily and Campbell. The kids enjoyed their cupcakes outside as the mommas started packing up. Ethan, Noah and Charlotte did stay at our house afterwards, but I made sure that they were willing to help pick up. Once everyone left, all the kids helped pick up the house and yard. I worked on the kitchen and just as I sat down, Robby pulled in. I think that he had been spying on me and didn't want to come home, until the work was finished. I had just a few minutes until it was time for us to load up to head back to church. We ran by the library first, and then on to church for supper. The kids were excited to get to church since the boys had a Christmas party-snacks and gifts (popcorn for Anderson and a Starbucks gift card for Graham), Whitman also had a party with cupcakes and games and Keaton and Campbell's party was cookies and games. Reagan was the only one without a party though they were supposed to wear their ugly Christmas sweaters tonight or bring their ugly friends. Ha! Once we made it home, we ran over to the Wilson's house for a little bit. We had a snack over there and stayed and chatted for a good bit. Then it was time for home and bedtime for the crew-tomorrow is a big day around here!-a birthday! 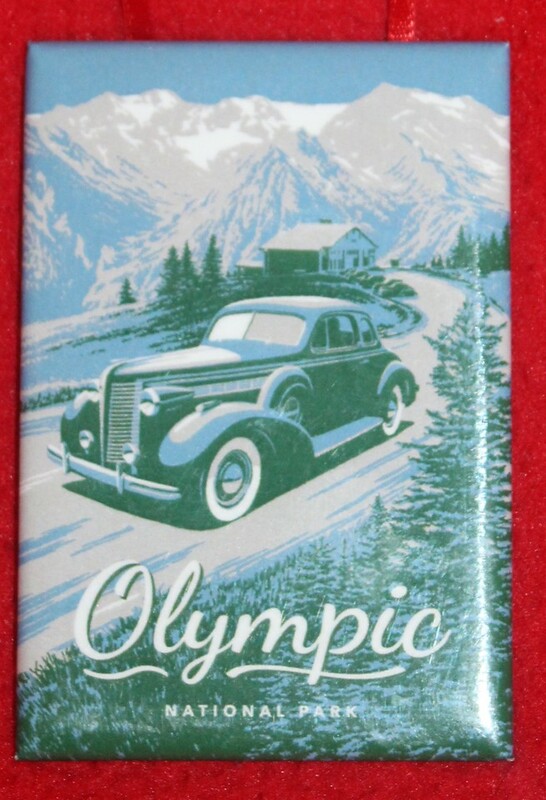 Hawaii was the 50th state for everyone (except for Whitman who soon made it to his 50th state in North Dakota). The cruise that we were on cruised through Glacier Bay National Park. There is something pretty spectacular about floating right up next to a glacier. The weather was a bit yucky outside, but we still braved the elements to take a few pictures outside. It was truly something to see. In the kids program, all of the kids were given Jr. Ranger badges and patches so one of those badges has now ended up on our tree. Here is that post. Another day with starting school a bit late. Today wasn't all my fault. Everyone had their breakfasts and were sitting in my room. I looked around and was missing a kid though. I guess I hadn't waken her up well enough. I ran up to wake her up and she groggily came down the steps. This morning at the end of our reading, I did look over and see Anderson snoozing away. He was wide awake while we were reading about Bloody Mary, but I guess reading our picture book about The Best Christmas Ever put him to sleep. The kids did their school work, and things were fairly uneventful. I am having to watch everyone fairly closely to make sure they do their work with excellence. Now I did let Anderson skip one thing today-I needed help in getting the house ready for tomorrow. And I figure after doing two pages of math, handwriting, writing, parsing 10 sentences, and a host of other things that skipping one little thing won't kill him. Keaton headed out to the dentist for an appointment at noon. They found a cavity yesterday, and we sure wanted to get her in for her work before the end of the year, so I jumped at today's appointment. The first one they mentioned was today at 8, which would have been a stretch! Keaton did perfectly at the dentist. Afterwards, she was rewarded with a drink. She sure hates shots at the doctor's office, but didn't seem to mind at all about anything that happened at the dentist office. And yes, our dentist has already text to check on her, if you ever need a recommendation let me know! Back at home, we were in Homeschool Day prep mode. We straightened and then moved all of the chairs out of the kitchen. For some reason, the moms all decided earlier in the year that we all wanted to make crafts for the kids to gift on our December date. What in the world were we thinking? I have supplies to make bath bombs which we tried and failed at (maybe tomorrow will be better) and cookies in tiny little jars. Campbell helped me sample everything and set everything out. There will also be games, presents and card making. I love a party and my kids love a party with 18 of their closest friends. Yep, that is 23, actually 24, kids at the house tomorrow-don't be surprised that Robby will be working in Conway. We worked all afternoon getting stuff ready. Then an hour before basketball practice, I ran to Walmart with the girls. Basketball practice was next. While I was sitting there, I remembered that I had a kid with a birthday this week so after practice, we headed off to Sams to buy some cupcakes for tomorrow. Once we made it home, showers were well underway. Robby made quesadillas for supper while I helped Reagan with her gift. Anderson asked for a snack tonight. We told him to find one and goodness the boy looked and looked for something and finally settled on cereal. I offered cereal to anyone else but didn't have any takers. I think that we have seen just about every place that good ole Abe Lincoln has ever been. On our spur of the moment trip this September, we saw Lincoln's boyhood home plus in Dearborn at Greenfield Village, we walked through a courthouse that Lincoln practiced law at. In addition, right next door at the Henry Ford, they have the chair that Abraham Lincoln was sitting in when he was assassinated. History is just pretty amazing and so is the wax figure maker at the Henry Ford. 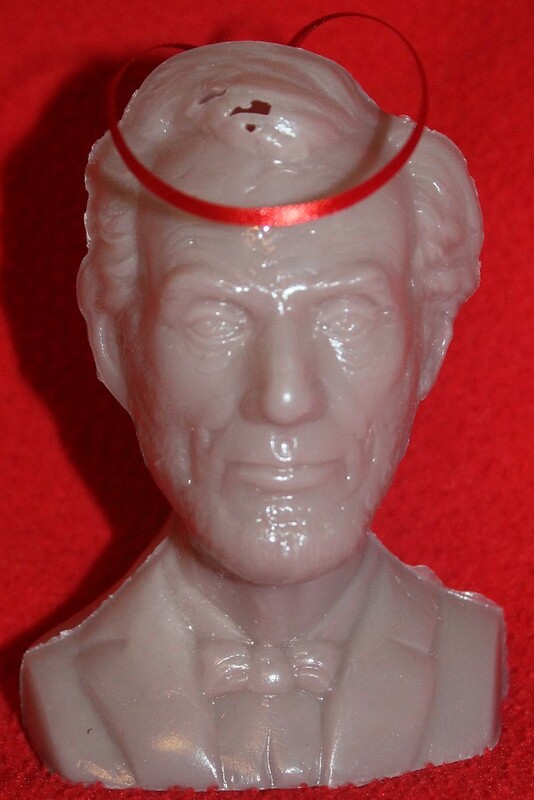 We thought we certainly needed a figure of Lincoln for our tree. Here are the pictures from the Henry Ford day of this year. Even though I slept in today, I still had to wake everyone up. Once I did get everyone downstairs, we grabbed our breakfasts and started on school. I did have to keep calling Reagan's name while I was reading because I was not sure if she was asleep or just closing her eyes. My bet is that she was snoozing, but she sure would respond quickly when I did say her name. School was fairly uneventful today. Whitman did work on one worksheet for about 30 minutes before lunch. Then after lunch, it took him about 4 minutes to finish it. I guess he realized that if he went ahead and finished it, then he could watch his ipad. After we did our school, we straightened a few things around the house and even did some more reading this afternoon. Then it was time to leave for the dentist. Last time we went to the dentist thinking that everyone had appointments, they did not and I had the wrong date. This time, everyone did indeed have appointments. Here was the dentist rundown-Reagan: needs to brush better, Anderson: has a cavity that is on a baby tooth so we will just wait, Graham: needs to floss, Campbell: has an odd permanent tooth but no worries, Keaton: has a cavity which we will fix tomorrow, Whitman: lots of wear from grinding on his front teeth. Now Whitman was the entertainment for the dentist today. He told then he was 100 years old. I did hear him once and peeked back there. It was taking 3 ladies to get him to do the xray. I felt bad for him-he was coughing and crying. Then he looked up at the lady and said, "you put that at the end of my throat." He recovered quickly and was soon just fine. After the dentist, I lost my mind and took the kids to the dollar store. Everyone bought a present for their homeschool buddy gift on Wednesday. Plus Keaton, Campbell and Graham bought Christmas presents for everyone in the house. I also had a few things to buy so we were in the store for what seemed like an hour or more. Then we even walked through Michael's before heading home. Once at home, we eventually found our supper before Santa's wrapping workshop officially opened. Everyone wrapped their gifts and gracious there is definitely a difference in how girls wrap presents and how boys wrap presents. I eventually became tickled at Graham's pitiful wrapping. I am not the best wrapper by any means but that boy needs some wrapping lessons. Once the wrapping paper was put up, I did look over my list and determined that I do still need a whole day of shopping to finish up. Hopefully that can happen soon! Tomorrow though is school, dentist, basketball and prepping for homeschool day with 23 kiddos here. 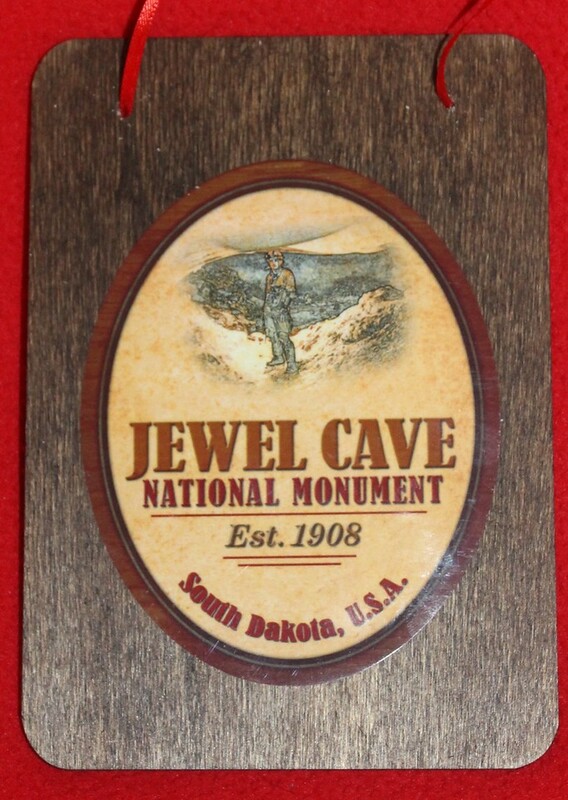 Now, our favorite part of Jewel Cave is the cement box out front. Some of their cave tours require you to crawl though this little cement box before going on the tour. The kids delighted in shimmying through it. Robby and I were wise enough not to crawl around on the ground trying to squeeze through a box for no reason. However, the kids will never forget it though. Click here for that's days blog.